Life and Breath Photography - What are you grateful for? The word for today is grateful. 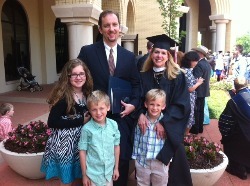 This past weekend I graduated from Southwestern Baptist Theological Seminary with a Master Degree in Missiology, which is a fancy word for missions and evangelism. It took me three years going full-time to complete 79 hours. It definitely was the hardest thing I have ever done in my life! Trying to go to school with three elementary age kids, while working part-time for EIATraining AND serving at my local church AND taking care of house and home was not easy. But it wasn't by my strength that I was able to complete this. It was totally a God-sized task and he is the one that allowed me to complete it. He gave me a wonderful husband that supported me, who took care of the kids all the times I was in Ft. Worth or at home studying. He gave me parents that took care of kids when I needed it and rode me with on some of my commutes to Ft. Worth, and a sister who did the same. He gave me parents-in-law who supported me, providing part-time work and encouragement along the way. He gave me mentors like Pastor Troy George who encouraged me to go to seminary and Jan Sutton, who mentored me in my ministry at Friendship International for graduate hour credit. And he put so many friends and family in my path that supported me and encouraged me. But the reason that I am so grateful is that God allowed me to finish what I started. There have been so many things in my life that I have started and not completed. Too many ideas with too little time has left a trail of uncompleted projects. But this time, I was able to finish. I am grateful for being able to go and even more grateful for being able to finish. I have friends that wish they could have finished their degree, yet life didn't allow them. So, I know that sometimes its not a matter of how much you want something, but rather, whether it is in God's plan for your life. So I am grateful..
Paul wrote these words to emphasize the grace that he had been given in being allowed to serve the Lord. The word translated 'grateful' here comes from the Greek word "Charis" which means "grace." The gratefulness is the effect of receiving grace. He also goes on to say that he was considered faithful, but he means "worthy of trust," rather than faithful in his actions. He wasn't faithful in his actions because when he was chosen to serve Christ, he had spent years persecuting Christians. Yet, God gave him a new work and a new mission - to share the gospel with all. Congratulations again, Jamie. Your calling to go to seminary and to complete the task reminds me of my calling at age 47 to go back to school and complete a Masters Degree in Psychology in preparation to be a counselor. I worked as a counselor for a number of years before retiring a couple of years ago. God has recently made clear to me that I have entered a new season of life with new challenges and ministry, and He will use all my past training, work and experiences in this new season He has called me to. God will use all of your gifts, talents, and training throughout your seasons of life as well. So, expect great things from Him and enjoy seeing Him use you as you walk in obedience to Him.